Research within the UW-Madison QBI can be divided into four thematic areas including computational, “wet” experimental, statistical, and theoretical biology as summarized below. Researchers across these themes often collaborate closely on data generation and analysis, and the research of many labs falls into multiple thematic areas. Extracting biological insights from high dimensional datasets requires novel computational approaches. Computational biology groups in the QBI are developing novel methods based on core computer science techniques such as machine learning, optimization, and graph theory, to address problems in the biological and biomedical domains including whole genome and transcriptome alignments and assembly, predictive modeling of complex phenotypes (e.g. electronic health records, brain imaging), analysis and inference of biomolecular networks (e.g. signaling, metabolic, transcriptional), and integrative analysis of diverse -omic datasets capturing systems-level behavior. Biological systems can now be characterized at both the nano-scale (e.g. single molecules) and meta-scale (including microbial communities), providing incredible opportunities for discovery. Experimental labs in the QBI are addressing fundamental questions using quantitative approaches, from the biochemical dissection and molecular modeling of RNA Polymerase to elucidating cancer treatments through synthetic tissue generation to understanding the systems biology of microbial evolution and ecology. Rigorous statistical models ensure the accurate description and interpretation of biological systems, and therefore a significant focus area in the QBI is statistical biology. 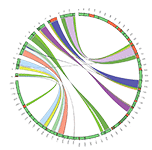 Research in this area is developing new approaches in statistical genomics (e.g. through new algorithms to align genomes, map sequencing reads, and represent phylogenetic relationships), novel methods in high-dimensional data analysis, and development of statistical theory. Theoretical biology is rooted in mathematical and statistical modeling of complex biological systems, often through simulations, to uncover underlying principles of living systems. Areas of research include theoretical population genetics, phylogenetics, cellular signal transduction, and viral population dynamics, among others.